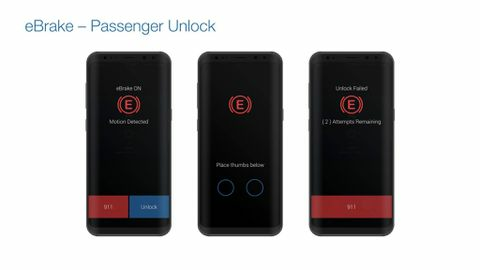 The eBrake app blocks incoming calls and notifications until a two-step cognitive test can be passed. Troy Spracklin got the idea for his distracted-driving app last year while pushing his son on a swing. His son tried to turn his head to look behind him while he was swinging, only to discover that doing so is disconcerting and feels dangerous. Spracklin realized he would need to provoke the same feelings if he was going to keep people from using their smartphones while driving. Along with his friend Colin Osing, he founded Vancouver-based eBrake Technologies Inc. and got to work on simulating that swinging experience. Once activated, the eBrake app blocks incoming calls and notifications until a two-step cognitive test can be passed. First, drivers must place both thumbs on their phone. Then, they have to move their device in time with an image bouncing around in a box on screen. Successfully keeping the image in the box for a few seconds shuts down eBrake and resumes regular access. As with looking backward while swinging, it isn't something that can be done at the wheel without instinctively feeling a sense of discomfort or danger. "You would never undertake this when driving because it's just too much to deal with," Spracklin says. "This takes it right off the table." Spracklin and Osing began testing their app earlier this year with Telus's technician fleet. They've partnered with Conduco Group, a distribution and marketing company based in Vernon Hills, Ill., and are now pitching it to enterprise clients, insurance companies and police forces. Spracklin believes that having corporations and organizations require their fleet drivers to use such apps is the first step toward solving the wider problem. With distracted driving directly costing fleet employers in the United States an estimated $8-billion (U.S.) a year, according to the Network of Employers for Traffic Safety, it's also where the business opportunity is. Spracklin and Osing's company plans to charge firms an annual subscription fee between $20 and $50 a driver, depending on customization requirements and analytics needs. One challenge the pair is still facing, however, is baking the app into phones' basic software so that it works more easily. The eBrake app can be set up to automatically activate on Android smartphones, but Apple has yet to allow third parties to do the same on its iPhones. Spracklin says he expects that capability to become available soon, but in the meantime, users must manually start the app. In either case, eBrake turns off automatically when it detects that the user is walking rather than driving. In Canada, road fatalities involving distracted driving as a contributing factor are increasing across all age groups, according to the Traffic Injury Research Foundation (TIRF). In 2013, almost a quarter of all fatal crashes involved distraction, the group says. The World Health Organization, meanwhile, calls distracted driving a "serious and growing threat to road safety." Experts say technological solutions such as eBrake are only one part of the solution, with education, stiffer fines and behaviour modification also necessary. "The main limitation of these types of apps is that they're still voluntary. We still have to rely on drivers to choose to use them," says TIRF marketing director Karen Bowman. "But if an app can help you overcome your addiction to technology … then definitely use it." Some app makers believe technology can be more than just a Band-Aid solution – that it can also be used to influence positive changes in behaviour. To that end, Vancouver-based Mojio – which makes the software in cellular-enabled car-tracking devices being sold by Bell, Rogers and Telus – is testing a system that would reward teenagers for driving well. Since the devices monitor driving habits, Mojio's app could be set up to provide incentives for teen drivers who avoid harsh braking and rapid acceleration, for example. Parents could reward them with free gas fill-ups or gift certificates to stores if, for instance, they can drive a certain distance without speeding or braking suddenly. Most importantly for teens, their driving performance would be backed up with actual data and not just based on their parents' arbitrary assessments. "Rewards-based behaviour modification works much better than punishment-based," says Mojio chief executive Kenny Hawk. TIRF's Bowman agrees with the approach. "There's something to not simply looking at punitive measures as a way to achieve the behaviour change that we're trying to get to."